Russia is not alone in disliking the idea of basing a U.S. missile defense system in the Czech Republic and other countries on its doorstep. Most Czechs aren't happy about the proposal, either. Recent polls in this former Soviet satellite, now a democratic NATO ally, show more than 60 percent of the public in opposition. U.S. President George W. Bush arrived Monday evening in Prague for a day of meetings with Czech leaders. The White House has billed a speech Bush will deliver Tuesday from the local headquarters of Radio Free Europe on democracy as the highlight of his visit here. His Czech counterparts have complaints with Washington to discuss, such as a two-tiered visa system for European nations that requires Czech citizens to obtain visas to travel to the U.S. However, the international debate over the missile defense system likely will drown out everything else during Bush's stay in Prague. The U.S. plan calls for an anti-missile radar base to be built at the Brdy military zone southwest of the capital. For their part, Czech leaders have brushed off Russia's objections, remaining receptive to the project. Prime Minister Mirek Topolanek called it "a necessary step which will significantly increase our security and also the security of our European allies and neighbors." Most Czech citizens, though, worry about Russian threats to take military steps in response, and they fear that the installation could make the tiny country a terrorist target. In Prague last weekend, more than 1,000 people protested the plan. Demonstrators planned to show their displeasure again Tuesday outside medieval Prague Castle, where Bush was to meet with Topolanek and President Vaclav Klaus. Over the weekend, Russian President Vladimir Putin stepped up already incendiary remarks about the U.S. and its intentions with the shield, warning that Moscow could take "retaliatory steps" including aiming nuclear weapons at U.S. military bases in Europe. Russia believes the shield in Eastern Europe is meant for it, and says it has no choice but to boost its own military potential in response. Bush's national security adviser, Stephen Hadley, called this sort of talk "not helpful." Still, he, the president and other U.S. officials have sought to cool down the situation _ to no avail. They insist the network is meant to protect NATO allies against a missile launch from Iran, not Russia. The president's speech in Prague could stoke the fires further. As part of taking stock of what the Bush administration calls its "freedom agenda," the U.S. president plans to mention Russia as a difficult area, Hadley told reporters traveling Monday with Bush to Europe on Air Force One. "He'll talk a little bit about the challenge of promoting democracy in countries, big countries in particular, where we have a complex relationship and a number of interests, places like China and Russia," Hadley said. He said the speech was not aimed at Russia, and that Bush would handle that bit of it "in a very responsible way." Still, the remarks were not likely to be well-received by Putin, with whom Bush was scheduled to meet two days later in Germany on the sidelines of the Group of Eight summit. With the Iraq war raging and that country in disarray, some criticized Bush's effort to refocus attention on his "freedom agenda" - the byproduct of the president's promise to predicate U.S. relations with all nations on their treatment of their citizens and to advance democracy in every corner of the globe. "The reality is the initiative is in disarray," said Grant Aldonas, an international business scholar at the Center for Strategic and International Studies and a former U.S. Commerce Department undersecretary in Bush's first term. "Following the outcome of Iraq postwar, when you travel the world, people react with cynicism when you talk about freedom and democracy at this point." Bush's message is typically better received in small, newer democracies. The Czech Republic, for instance, has deployed troops to help support the U.S.-led campaigns in Iraq and Afghanistan. 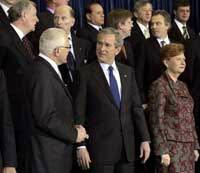 Bush was invited to make the speech as part of a conference on democracy hosted by Natan Sharansky, a former prisoner of the Soviet regime who has continued to champion freedom, and former Czech President Vaclav Havel, who led the Velvet Revolution that ended communism in the former Czechoslovakia in 1989. The president also plans to meet with current and former dissidents from around the world. From Prague, Bush was to travel to Germany's Baltic Sea resort town of Heiligendamm for three days of meetings between the leaders of the world's eight major industrialized democracies. The rest of his eight-day European trip was to include a stop in Poland - also a proposed site for part of the missile defense system - as well as visits to Italy, Albania and Bulgaria.